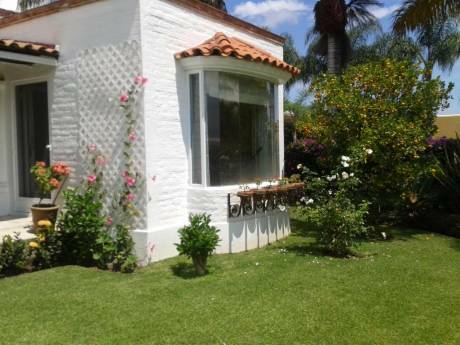 Lovely hacienda-style home in great climate near lake & Guadalajara. Enjoy breakfast on the upper patio by the heated pool as you listen to joyful birdsongs; lunch in the front courtyard under the shade of our grapefruit tree; dinner on the screened terrace with a fire in the center fireplace or on the lower patio with steaks off the grill of our al fresco kitchen. So many choices. Our walled-in hacienda is a haven with mountain views, bright Mexican colors, flowers everywhere and lots of room for several guests to spread out or come together. The house is at the west end of Ajijic, about 1-1/2 blocks from Lake Chapala, Mexico's largest lake, and 5 blocks from Ajijic's lovely central plaza. The main house has a large master bdrm (queen bed) with door to the patio area. The master bath includes a jacuzzi and separate shower. Also (main house), there is a study with trundle bed and bath with shower. The dining room table seats 10-12. Liv. room has a large flat-screen TV with DISH cable service. The large kitchen has 2 ovens and eating counter. There is a guest bath off the kitchen. A separate casita has liv. room (queen sofabed), bdrm (queen bed), bath with tub/shower and kitchen. A separate entrance guest room has its own bath with shower. Much of the house has been recently renovated. We have a water purification system, 5 fireplaces, and 11 ceiling fans for the warmest months. It's a place we love enough to 'vacation at home'. The maid comes 4 days; the gardener 3 and pool service 2 days each week. We are John and Andrea, 81 and 76 years young with a lot of energy and enthusiasm for new adventures. Our home reflects our years of extensive world travel. We have lived and worked in the US - East, West, TX, MI and Hawaii (4 years); Heidelberg,Germany (1 year), Japan (near Kyoto - twice) and now Mexico. Our children have lived as adults in Japan, Zimbabwe and Australia. John is a retired PhD chemist who has worked on the Apollo space program, in academia at SUNY-Stony Brook and Mich State Univ, and as a consultant/textbook author in the field of forensic science. 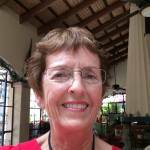 Andrea is a retired math teacher and now retired academic specialist and Assistant to the Dean for Study Abroad (College of Social Science, MSU). We love our life in Ajijic with so much to do and a community of friends from all over the world, but we still feel the pull of experiencing other places in this wide, wide world. We can do non-simultaneous exchanges, and would enjoy playing host. 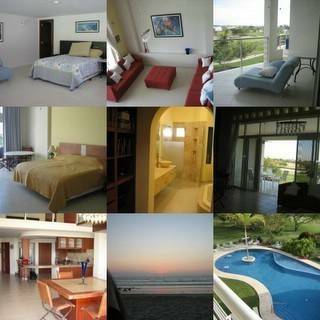 We ALSO have available a villa on the beach in Cuyutlan, Colima, Mexico. 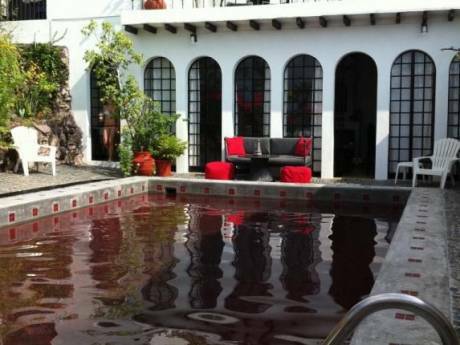 It is a 3-hour drive from Ajijic, just south of Manzanillo on the Pacific coast. The village of Ajijic has captivated people from all over the world. Yet it still retains the feel of a Mexican village with its cobblestone streets, abundant horses and frequent colorful festivals. There is a large art presence in our town. We have an excellent auditorium which hosts a wide variety of music and dance performances; a little theater; 2 cinema complexes; 2 weekly open air markets; and a rapidly developing water front area on the lake. Ajijic is just 35 minutes from the Guadalajara airport. The local bus runs right past our house, and our next door neighbor has a taxi service. There are small food stores in our neighborhood and two larger grocery stores within 1-2 km that sell a wealth of international food products. 5 km to the west is a large hot spring spa complex. A long bike path runs from Ajijic in either direction toward Chapala or Jocotepec. Nearby, horses are available to rent, with or without a guide. There is a wonderful water park for kids of all ages about 1.5 km from our house. Guadalajara is Mexico's 2nd largest city and has a lovely colonial center. It is also known for two large market towns on its outskirts, Tonala and Tlaquepaque. A local tour company http://www.charterclubtours.com.mx/ offers numerous day and overnight excursions from Ajijic. A nice description of Ajijic with photos is available at: http://casadelsolinn.com/about.htm ENGLISH is spoken widely in this area.